XLSafe PRO 2.90 - Download Win Apps. Secure, encrypt, protect and restrict access to Microsoft Excel spreadsheets. 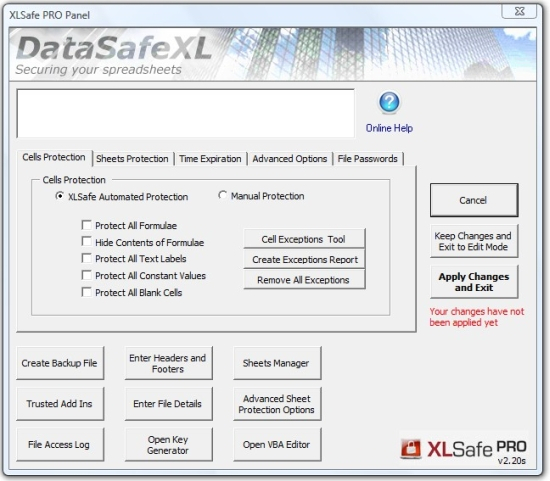 DataSafeXL - secure Microsoft EXCEL Spreadsheets, protect VBA code, formulae and restrict access to your files. With XP you can protect your spreadsheets automatically and create files with time trial features. In comparison to XLSafe PRO is the next step in MS Outlook Synchronization. It delivers industry strength for lightning fast and robust synchronization of large Outlook files between two or more computers. Supports synchronization with MS Exchange Server.